Benign liver tumors include hemangiomas, adenomas, hamartomas, nodular hyperplasia, etc. They are surgically treated if they entail symptoms, or in case of oversized tumors, or if there is a risk of rupture or hemorrhage. Hemangiomas affect women more frequently and they usually are accidental findings when exploring the liver. When they are large, they may cause atypical symptoms (pain), while in some cases there is a risk of rupture or serious hemorrhage. Diagnosis may be achieved via CT scan, but MRI remains the diagnosis method of choice. Treatment consists of surgical resection with enucliation, segmentectomy, or even atypical hepatectomy. These procedures are safely and effectively performed laparoscopically at centers with sufficient experience. Adenomas mainly pertain to women and have been associated with the use of contraceptives. They are well delineated solitary or multiple tumors. They are totally asymptomatic. They may, however, present with abdominal pain and intra-abdominal hemorrhage related to menstruation. In case of liver adenoma it is recommended to discontinue contraceptive due to risk of relapse. Treatment consists in excision; however, in cases of small (3cm) tumors, regular follow-up by ultrasonography may be recommended. Other less frequent benign tumors are hamartomas and nodular hyperplasia. Hamartomas are solitary or multiple tumors of particular histology composed of an overgrowth of tissues. Nodular hyperplasia is another non-frequent benign condition, which, when resulting in the appearance of a large formation, needs to be surgically removed. 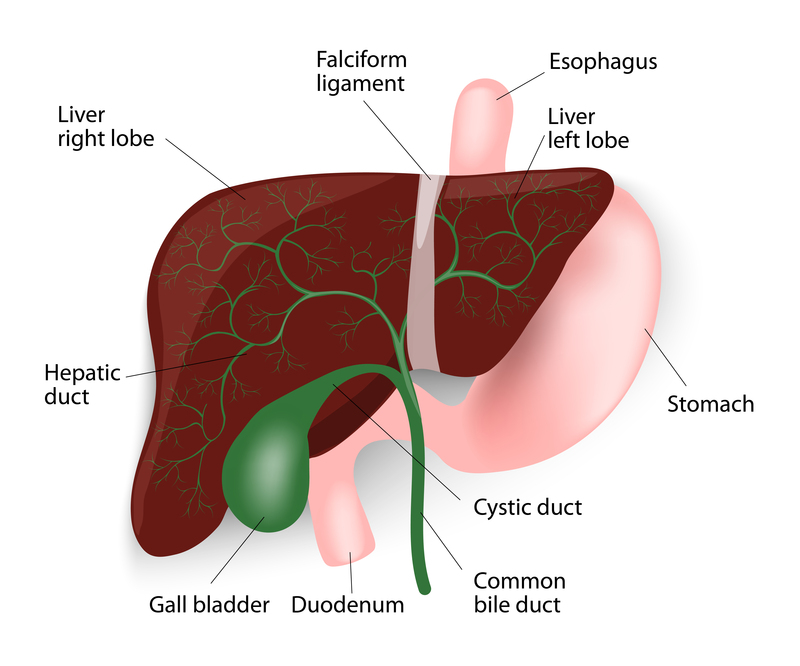 Hepatic cysts are classified into parasitic (echinococcus) and non-parasitic ones. The non-parasitic cysts may be of traumatic etiology, dermoid, intrathelial etc. They can be solitary or multiple, they affect more frequently women aged 40-60 years old, and they contain translucid liquid. Some solitary cysts are considered to be cystadenomas; that is why their regular monitoring is required and they need to be surgically treated. The polycystic disease of the kidney is a condition characterized by the presence of multiple cysts in the liver and other organs, most often the kidneys. Hepatic cysts usually do not cause symptoms. When they are large, they cause pressure effects on adjacent organs they may cause pain and other symptoms. In case of rupture, they may cause acute pain and intra-abdominal hemorrhage. Diagnosis: it is obtained via liver ultrasound and CT Scan. Treatment: Small and asymptomatic cysts may be managed by monitoring. Small and asymptomatic cysts should be monitored. Cyst wall puncture guided by CT scan is a therapeutic choice. The cyst, however, relapses most of the time and fills again with water requiring several sessions. The treatment of choice is the surgical excision of the cyst. It is a difficult procedure that may entail hemorrhage or bile leakage (cholorrhea) from the liver parenchyma. Alternatively, the cyst may be surgically drained and deroofed to ensure continuous communication with the peritoneal cavity as well as the injection of special solutions. Laparoscopic surgery presents some clear advantages in the management of liver cysts, since in addition to its well-known advantages (shorter hospital stay, fewer postoperative complications, etc.) it presents laparoscopic surgeons with better images from inside the cyst thanks to the magnifying camera and may ligate any small biliary ducts responsible for postoperative cholorrhea (a condition followed by significant postoperative morbidity).